The mining industry has played a significant role in Latin America, yet few scholars have paid much attention to its appearance in literature. Juan Felipe Hernandez, PhD candidate in Hispanic Studies, plans to change that. Here, he reflects on why he pursued graduate school and describes his latest research on Latin American mining literature in the 20th century. If you feel bored with life and under-stimulated by mindless entertainment, graduate school might be for you. I was tired of living the kind of life that consisted of simply going to the mall, hanging out with friends who didn’t really say anything interesting, going home, watching TV, and repeating the cycle all over again. My mind was just asking for more. I could feel it. So if you’re bored with life and friendships that don’t add much, if you feel under-stimulated by mindless entertainment, and if you feel like your brain is asking for more, then, by all means, graduate school might be for you. There are other avenues to feed this need too, like learning a new language, volunteering, or settling into a different country, but grad school is definitely one of them. It can be difficult, though. It’s a very specialized path for four or more years of your life, so that can be tricky. That’s too long for some people. There are also no guarantees; it can be challenging to translate your work of many years into money or a stable position. However, grad school is a great place to stimulate your mind and meet very interesting people, especially if you have a strong interest in ideas and thought. It’s tough, but also very fulfilling. What attracted you to literature studies at UBC? Literature gives you a bigger picture and exposes you to a larger universe than you would get from an average history book. Novels, poems, and short stories—they’re very anti-specialist. Literature tells you everything: the events of a character’s life, the politics of their country, their cultural and social experiences, their family life beyond closed doors, even their intimate feelings and emotions … You have so much to work with! You could take a psychological approach, you could do a cultural analysis—there are so many ways of unpacking that same novel. My advisor often reminds me to cut down on what I say, because there’s so much I can say! That’s the great thing about literature. I also wanted to experiment with different critical methods for studying literature other than Marxism, which I find very conventional. Most of the tools I use are drawn from other disciplines like eco-criticism, speculative philosophy, materialism, and post-structuralism. I take intellectuals who aren’t literary thinkers—philosophers or theorists who specialize in other areas—and try to mix their thoughts. It’s a little project of mine to seek different ways of studying novels. I came to UBC because the Department offered me a good scholarship that lasted four years, and because I wanted to work with Jon Beasley-Murray after reading his book. When you see someone like Jon and his work and approachability, it makes a lot of grad students excited to work with him. He’s a very thorough and effective advisor, which has made an impact on my work. Miners were a huge political force, yet we never regard them as important in Latin American literature. Armed miners during the Bolivian Revolution (1952). I study Latin American literature about ‘mining’ and ‘miners’ in the 20th century. I focus on three specific countries: Chile, Bolivia, and Peru. I was drawn to this topic because the figure of the ‘miner’ is largely ignored by literary critics, even though there are a lot of novels, poems, and short stories about this topic by Latin American authors. I wanted to address that void. I was also drawn to this topic because Vancouver is the mining capital of the world, and there was a relevant connection to be made there. Why is the mining industry particularly significant in Latin America? Economics – In Bolivia, for instance, mining accounted for 90 per cent of the country’s income prior to the 1950s. They sold tin and silver to the United States, which was used for war materials and cans containing food for troops during the First and Second World Wars. So in terms of macroeconomics, these minerals were very important to Bolivia. Politics – In 1952, Bolivian miners overthrew the government in an event known as the Bolivian Revolution, because the working conditions were so terrible—workers were treated badly, even women and children were forced to work there, and the American management antagonized them. Miners were a huge political force, yet we never regard them as important in Latin American literature. Environment – Canadians are authorities when it comes to mining technology because they’ve been doing it for so long, but people need to be aware that there are consequences to the wealth brought to Canada, especially on the wellbeing of families in Mexico and Peru where Vancouver-based companies operate. When you mine for gold, you have to use toxic minerals to extract them, which stay in the atmosphere for thousands of years. In Colombia, where I’m from, there have been many protests against mining corporations. People are driven away from their homes and into the city, begging for money or becoming working class people, because their rivers and waters have been contaminated. Wealth and resources are directly linked to the poverty produced by corporations in these countries. It’s very complicated. What insights have you gained from your literary analysis? When analyzing literature, you find unexpected things, surprises. You begin to feel like a miner, yourself, looking for things. When I read that passage, I started to think that maybe mining was more than just two separate things: a person and a rock. Maybe it actually creates a strange new thing that becomes ‘miner-mineral’. The miner becomes one with the commodity, because it’s inside you. On a biological level, we are full of minerals—our bones, our blood, different proteins, everything that makes up our bodies contains minerals. To what extent are we also made up of small rocks, non-organic and dead things, like metals, that you can’t eat? I find that interesting. When analyzing literature, you find unexpected things, surprises. You begin to feel like a miner, yourself, looking for things. Sometimes you feel hopeless, like there’s nothing there, that maybe if you push a little more, read one more story, you’ll find something worthwhile for your thesis. So, to an extent, the literary critic becomes a miner. I am analyzing those dynamics. The mineral, itself, attracts a whole group of people and entities. When this happens, the author arrives and starts writing a novel about these events—so he too, in a way, is a miner. Then, someone like me, a literary critic, observes the processes that the miner underwent, and the processes that the writer underwent, and how all of this connected. I hope my research will open an avenue for future scholars to study materiality—how materials and physical things are present in literature—and not only focus on ideas, political processes, or metaphysical things, even though these are interesting. Finally, I hope Latin American studies will continue to address these novels that I’m trying to “dig” out of forgetfulness. 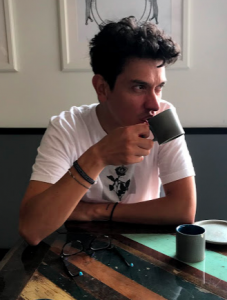 Learn more about Juan Felipe Hernandez and his work through his blog.